I recently read that living out your passion can be defined as doing something that is “core to who you are” and is “a positive, intense feeling that you experience for something that is profoundly meaningful for you as an individual”. That phrase; “profoundly meaningful” stood out at me as I read that quote. It begs a deeper reflection on how we are living our lives. At what level are we living out our daily existence? When last did we experience something profound? What is profoundly meaningful to us? I’m a believer in living life to the fullest. I believe in finding strategic ways to get to the place in our lives where we feel we are living the best life we can. What is constantly on my mind however, is trying to understand and live out the principles that make the passionate life possible. If living out your passion is to engage in something that is “profoundly meaningful” then we need to look at our lives and assess whether or not we are touching the things that are profoundly meaningful to us. Upon reflection, like me, most of you reading this will answer with a “no” and confirm that you are not living in that daily profoundness. You’ll hopefully realize that the “sideshows” of this life, big houses, titles, notoriety and the pursuit of self glorification, have caused you to miss out on the depth of the profoundly meaningful. You’re living life on the surface, seemingly and blindly “content” with the veneer of the good life. What those words made me realize was that there is a deeper, more meaningful way to live. It’s the daily connection with your “profoundly meaningful” that will make life glorious and full for you. We only have one shot at this life. As the old saying goes “there is no dress rehearsal”. The future is unfolding for you as you read these words and the way in which you choose live now will impact your tomorrow. Choosing to live from a deeper place is not easy. It’s hard looking inward and asking the questions that very few have the patience to find the answers to. 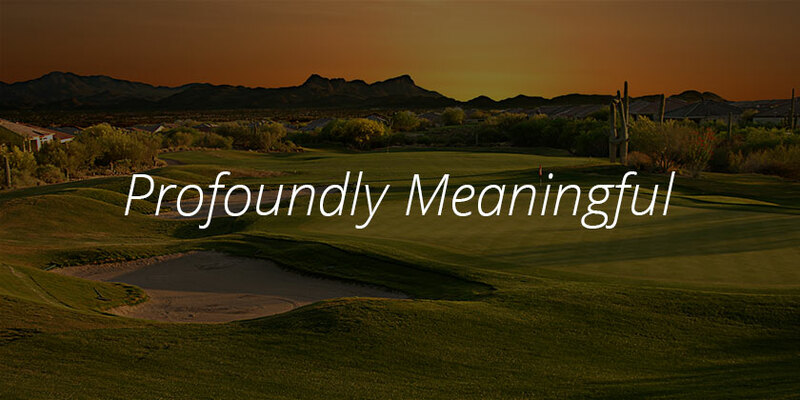 But in the depths is where the “profoundly meaningful” is. To make the most of this gift called life we have to, as a matter of urgency, find and live out our passions. If you truly desire to live a life of fullness you have to connect with what makes you come alive. There is no other way to live life to the fullest. You can only experience the fullness of life when you are fully alive. A life lived on the surface, distracted by the pressures of society will disconnect you from the things that truly move you, from the profound and awe-filled experiences of your life that bring you true and real joy and create your passion. Whilst the pursuit of my passion as it relates to a career or a contribution to society is a vital foundation for a successful life, I have also realized that I have, for quite some time now, had the “profoundly meaningful” in my midst everyday when I open my eyes. That meaningful profoundness is found in my relationship with God, it’s in my incredible wife and in my precious daughter. It’s in my family and in my closest friends. There is no elusive secret to living a life of upmost joy and passion. Often times the “profoundly meaningful” in life is either watching over you, laying beside you or hugging you in the morning.